Bes was a widely worshipped deity in ancient Egypt and was believed to be the deity of music, merriment, and childbirth. As such, Bes was thought to be a protector of children, and depictions of him were frequently seen in the bedrooms of ancient Egyptian households. His unruly beard, lion’s mask, loud instruments, and wild dancing were all thought to drive away any evil spirits that attempted to infiltrate the house. Additionally, Bes was thought to be a protector of both couples and pregnant women, and was commonly worshipped by ancient Egyptian newlyweds. Bes was consistently shown as a dwarf-like being, with arms much too long for his body. This depiction of what the ancient Egyptians viewed as an “imperfect” human is very unusual among artwork of deities, and it is theorized that his stature is the result of corruption from his encounters with malevolent spirits. Additionally, many ancient Egyptian cups or vessels were fashioned in the form of Bes’s head. It was believed that the liquid contained within these cups would acquire the healing properties of Bes, and as such, were often used for medicinal practices. 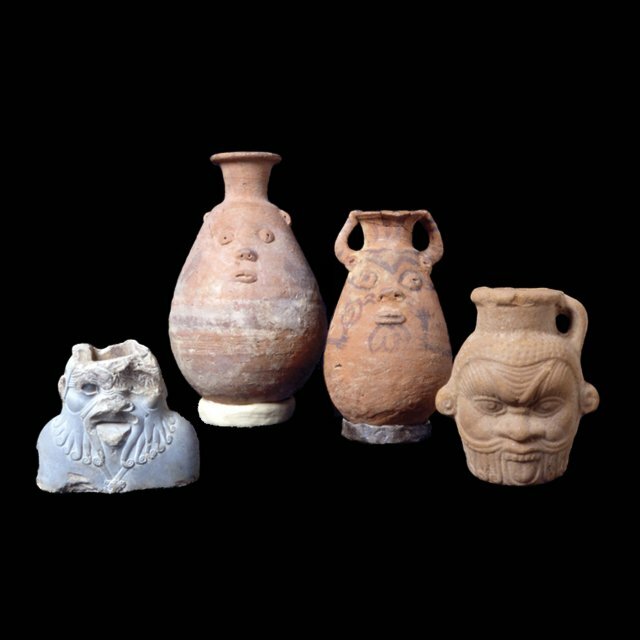 Image: RC 2220, 216, 217, and 1704 Bes Jars at the Rosicrucian Egyptian Museum.